I love decorative storage boxes. You know those pretty ones that just make you drool when you see them. I just can't see spending that much money on something I can make myself. So, I decided to make my own decorative storage boxes. Since Christmas I have saved every kind of box that has come into this house. Any box that looked like it could hold a fair amount of "stuff". Because , quite frankly I have a lot of "stuff". Then I went to Dollar Tree and picked up some wrapping paper. a lighter weight light blue paper. I am using blues and browns throughout the house so they will fit in nicely. Then I went about covering all those boxes. organizing all the stuff in the cabinet in our bedroom. This is an old pie safe that my father painted and gave to me some time ago. It is one of my very favorite pieces. that were really not pretty to look at. it is always a visual eyesore. totally stuffed with all the above listed items and a few more. This is the end result though. Everything nicely organized inside it's own special box. These boxes are on the first shelf. They are plain packing boxes we received in the mail. I covered them with the brown print paper. Then I used blue and black to make numbered labels on them. The little white trim is some button hole trim I have had for some time. These boxes actually hold a ton of CDs, DVDs and books. all organized and easy to get to. The second shelf has two covered boot boxes on it. I used the brown print and the plain blue paper to cover them. Then I embellished them with the button holing. The labels are blank at this time because I haven't filled these boxes yet. But, it won't take long for me to find the perfect things to fill them with. I wanted to have a coordinated look. so I didn't feel I needed to cover them. The two dishes are some blue ware that were my Mother's. The bottom shelf has two boxes also. One being a boot box and the other being a shoe box. Both covered as the others. some little hearts I made from felt, drop cloth and lace. a blue glass bird that was my mothers. I am really loving the way this turned out now. it is so pretty to look at instead of all that clutter that was in there. And, this is such a quick, simple and thrifty makeover. I am going to be doing in there. 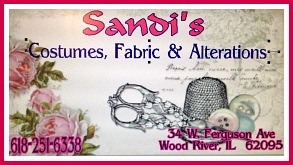 Do you have some areas that could use a few decorative boxes? I love your choice of papers. Everything looks fresh and springy all contained in your cute boxes. What a great idea! Your boxes and shelf display are lovely! Those turned out so cute, great organization too. Love the cabinet and the boxes look so pretty! Those look great! Beautiful colors. Beautiful boxes! Love the colors. Wonderful storage ideas and love the colors you used - thanks for sharing this on your #simplybebetsy gallery! Great addition. We pin, Google, Facebook, and bloglovin on all our submissions. Great ideas. I am in the process of getting better organized. I have pinned for reference. I am following you on social media. Dropping by from the Bloggers Brags Pinterest Party. They are wonderful, I really like the colors you used! Absolutely darling! I have so much STUFF and am always trying to find new organization techniques. You have created such a beautiful USEFUL method. Brava! I'm pinning, too. I found you ojn the Pint it Party (from Creative Geekery!) and I am so glad I did. Practical AND cute at the same time! What a perfect idea! 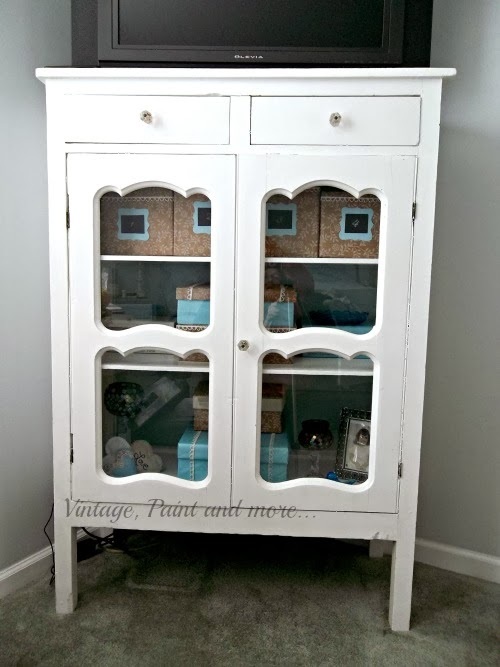 I love all the storage this cabinet has for you and the way everything is neatly displayed! Great job!!! You did an amazing job! 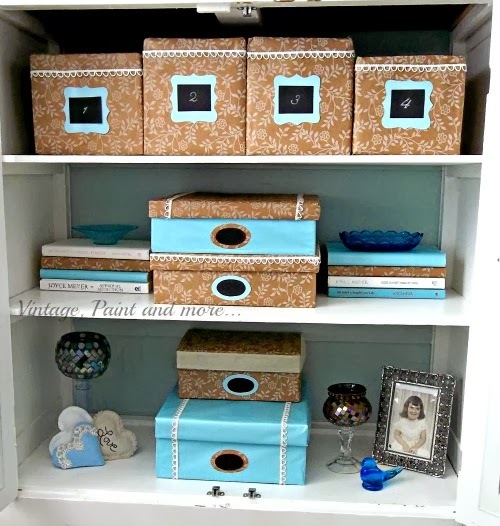 Love the colors and how cleverly you used various boxes to store things. 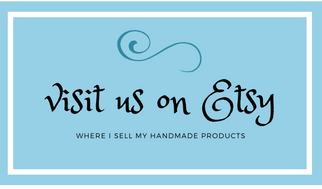 I have lots of stuff also!! Thanks for linking to TTF this week. Aren't you a creative soul! Smart lady too! Have you put together a tuitorial to show us how you did this? Hint!Hint! You could start your own business. I love the pattern you used for these storage boxes! Thanks for sharing your creative side with us and for linking up over at Tell it To Me Tuesday! We hope to see you linking up with us again! Those are pretty boxes! I love the colors. This is a great idea, especially if you have a lot of things to keep and if you’re on a budget. It goes to show that when you’re low on budget, all it takes is a little creativity.